While the name may say “fly fishing,” most of you are aware that I am certainly no stranger to the spinning rod. I carry quality G.Loomis rods and Shimano Stradic spinning reels for your use. In addition, you are more than welcome to bring along your own tackle on your guided trip. I always love to compare tackle and techniques with my fellow anglers. In gearing-up for the 2012 fishing season one of my first steps is this slightly overdue newsletter. During the past few weeks, I have made the occasional trip to the Chesapeake Bay Bridge Tunnel (CBBT) with some nice rockfish being caught on both fly and spin tackle. Take a look at the fishing reports section of my blog for the latest in CBBT action. 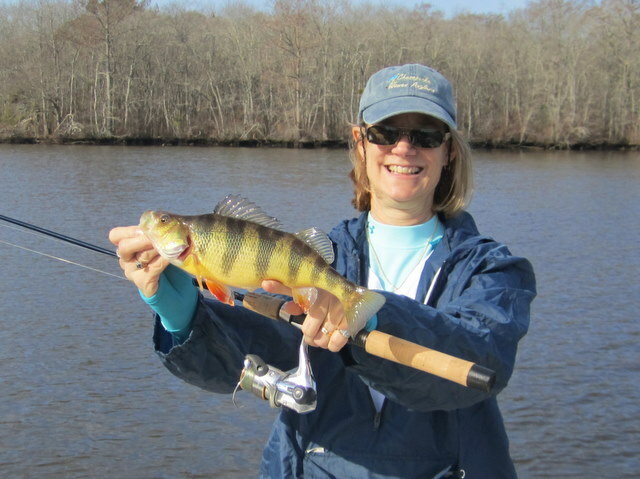 The next couple of months will also yield some very good light tackle and fly fishing action on the Pocomoke River. See below for trip info. Now for a brief rundown on what to expect in the coming weeks and months. Pocomoke River – I am currently booking trips on the scenic and wild Pocomoke River. We’ll put-in at the Byrd Park ramp in Snow Hill, Maryland where we will chase yellow perch, crappie, pickerel and largemouth bass. This is a great way to spend a midwinter’s day casting ultra-light spinning or fly tackle. The winding nature of the Pocomoke creates many protected and productive shorelines that can be fished comfortably, even as cool winter breezes keep bay boaters in port. The all-inclusive cost for a six-hour trip is only $275 and I’ll supply the coffee and donuts. 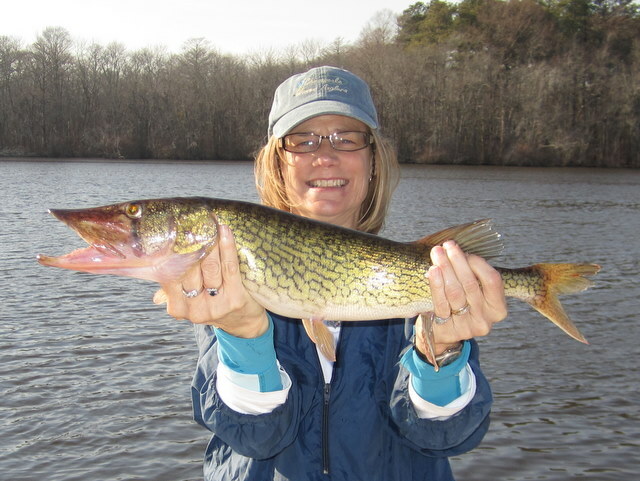 Take a look here for some of last season’s Pocomoke action Pocomoke River Fishing 2011. Susquehanna Flats – Even though last season’s flats fishing was a bust, I believe that with this winter’s low snowfall (so far) amounts, this coming spring’s catch & release flats fishery could prove to be outstanding. There have been good numbers of big fish in the lower bay and offshore of the Virginia Capes; so I’m looking forward to a big migration towards the Susky this spring. I have some good dates available during the peak period of the last two weeks in April, so book early to get the day you want. Red Drum at Fisherman’s Island, VA – I have had quite a few requests to make the trek to the barrier islands of Virginia near the CBBT to try for trophy red drum during the spring run. There has been a super fishery for the past few years with big reds averaging 30 to 50 pounds. While much of this is fishing live bait, on good weather days these fish can be caught casting bucktail jigs, spoons and flies. If you would be interested in this type of trip, please let me know well in advance. The timetable for this will be the first week or two of May. 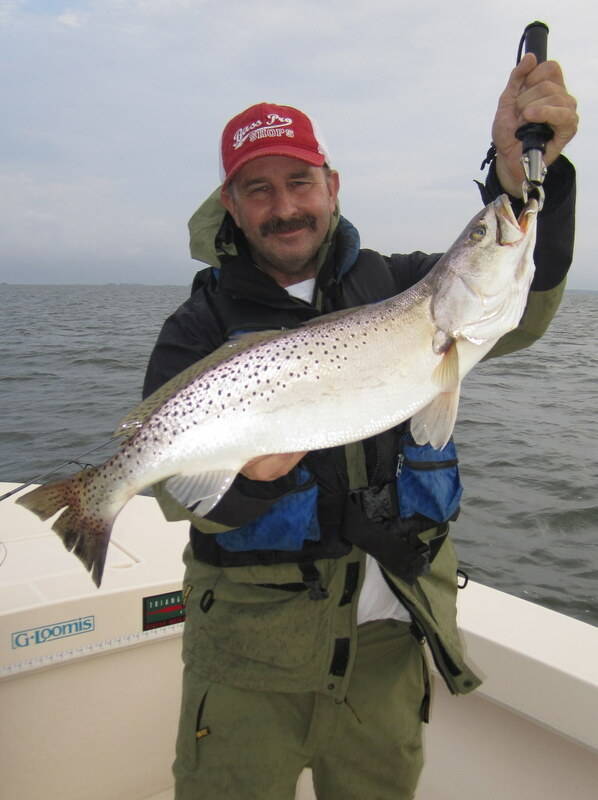 Tangier Sound Spring/Summer Fishing – What with the mild winter weather we have experienced, I really expect to see some great speckled trout fishing beginning around the first of May. We caught some BIG specks last fall, and a spring run of big pre-spawn trout is long overdue. 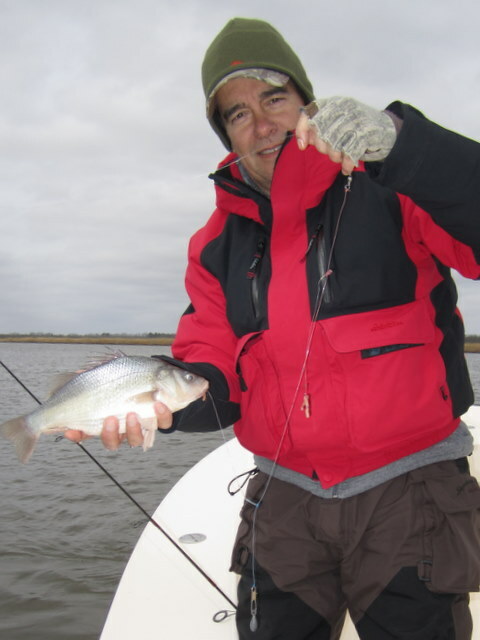 Don’t miss out on the return of this great shallow water gamefish. 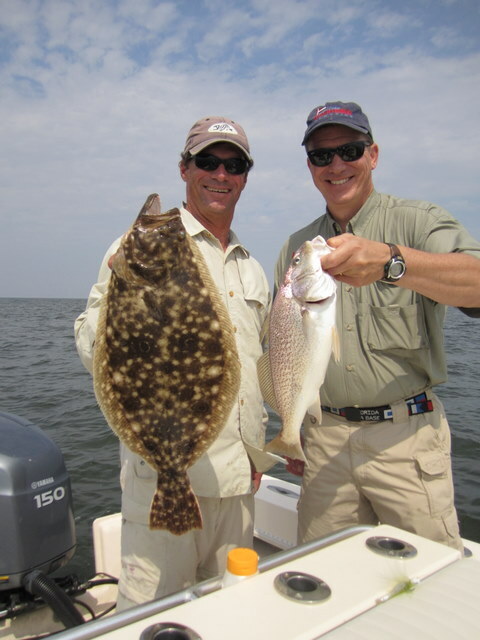 Flounder fishing was off-the-charts last summer and I am hopeful for more of the same in 2012. Bluefish provided fantastic light-tackle action throughout the late spring and summer months in 2011, especially for fly-fishers looking for a good fight on the long wand. The early morning rockfish bite was very good at times, as big stripers smacked out Storm and Stillwater poppers all over the sound. There is plenty to do while fishing out of Crisfield. Winter Speaking Engagements – I will be speaking at several fishing club meetings and events in the coming months, so if you’re in the neighborhood stop in and say hi. February 8 – I will be speaking at the monthly meeting of the Saltwater Fly Anglers of Delaware in Lewes, DE. Come out and enjoy a PowerPoint presentation on Tangier Sound Fly Fishing. I will also touch on the Susquehanna Flats C&R fishery and my outlook for this spring. The meeting begins at 7 p.m. and you will find directions on their Web site. February 21 – I will be speaking at the monthly meeting of the MSSA’s Essex/Middle River Chapter at the Commodore Hall in Essex, MD. Located at 1909 Old Eastern Ave., the meeting begins at 7:30 p.m. I will give a PowerPoint presentation on Fly and Light Tackle opportunities on Tangier Sound, with a special emphasis on the great speckled trout and flounder fishing that we enjoyed this past season. I’ll briefly touch on the Susky Flats as well. Come on out and enjoy an evening of fishing talk! February 25 – I’ll have a table at CCA’s 10th annual TieFest, the region’s premier fly-fishing show, located at the Kent Narrows Yacht Club in Chester, MD. Show time is 10 a.m. to 4 p.m. and admission is free. This is a must-attend event for any fly angler who’s wet a line in saltwater. I always book a lot of trips at this show, so arrive early and stay late. The food and friendly atmosphere make this my favorite event of the entire year. See you there! A final note: I am in the process of updating my Web site Josenhans Fly Fishing with new photos and graphics. In addition, for the most current reports and happenings, please check-out my blog at Josenhans Fly Fishing Blog as daily reports may be posted here before they are distributed via the e-newsletter. Thanks for reading, and here’s to a fantastic 2012 season!